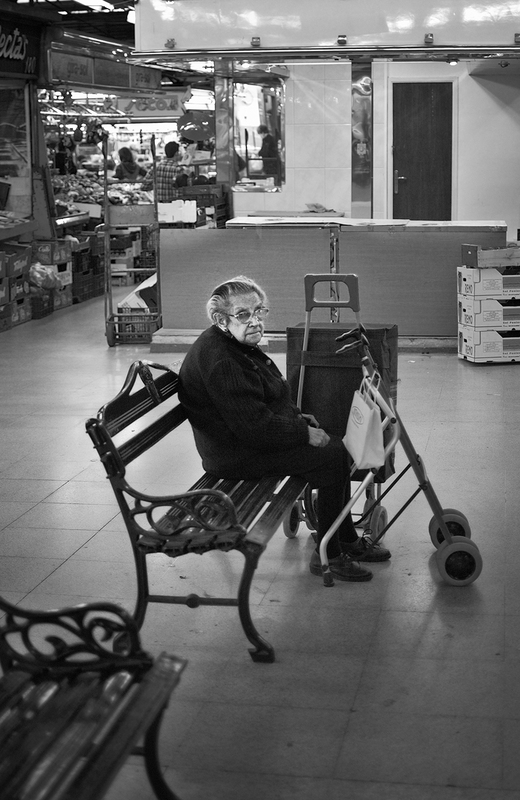 Patiently waiting for her turn this sweet old lady seemed to have stopped time in Mercat de l’Abaceria Central at Travessera de Gràcia, 186 one of the almost 45 markets there are in Barcelona city. The image of elderly people carrying a shopping trolley bag is quite familiar over here as it is relatively easy to buy food just across the street and important markets are just a few bus or subway stops away. Gracia quarter is one of those neighborhoods with a little bit of everything, shops, bars, terraces, architecture, art galleries, pedestrian-friendly streets, trees, beautiful squares and a bohemian atmosphere. Curiously this quarter I haven't covered much in Barcelona Photoblog in the past. I hope I change that soon. I can't wait for more pictures of the Gracia quarter, my favourite place in Barcelona.